Just when you thought it was safe... The NF210-HZ1 is Samsung’s second Shark netbook. The matt HD screen and powered USB of the first Shark are omitted; but it scores points for portability - a 3G UMTS module is included as standard. Is this a useful addition to Samsung’s range? 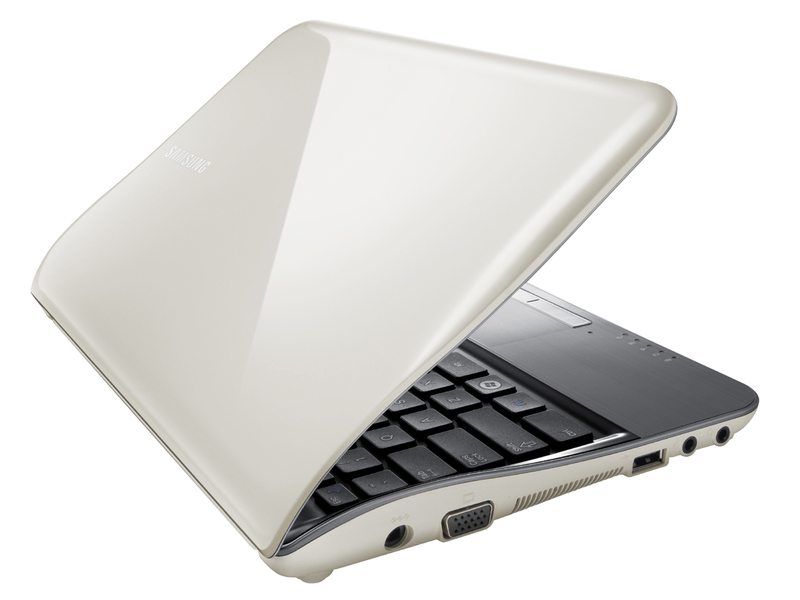 Samsung announced three new netbooks in the NF series at the IFA convention in Berlin in 2010. 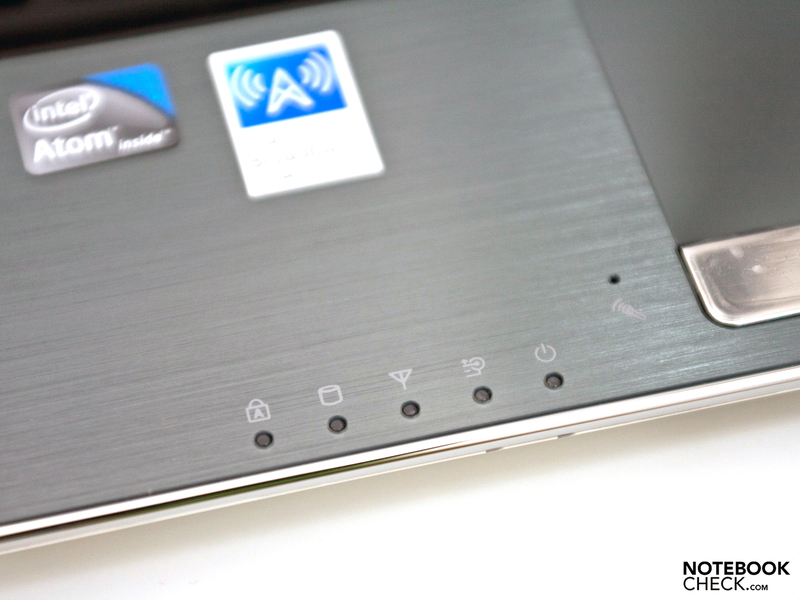 This included the NF210 with a 10-inch screen and Intel Atom N550 dual-core processor (2 x 1.5 GHz). Two versions of the NF210 are available, each with a 250 GB hard drive and 1 GB of DDR3 RAM. The only difference: the NF210-HZ1 which we are reviewing is fitted with a 3G module as standard. 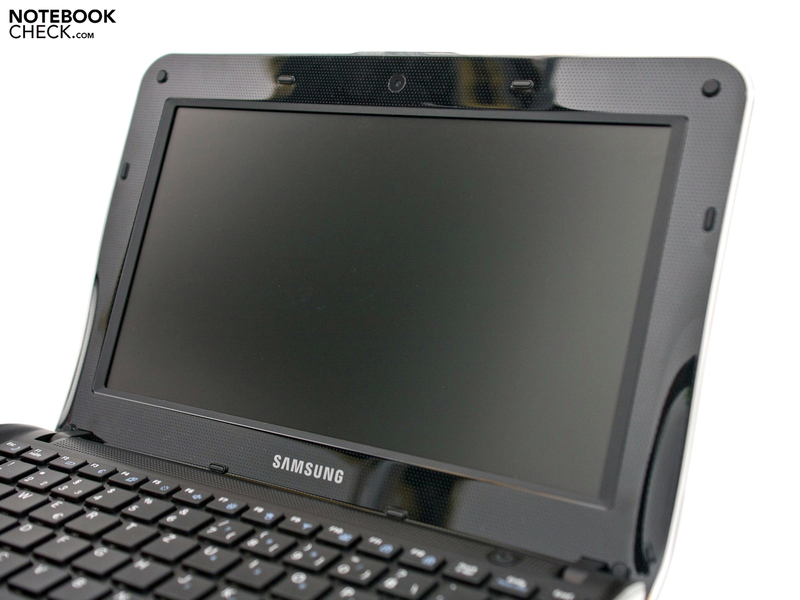 Having reviewed the Samsung NF310-A01, we have to ask: why has Samsung released a second 10-inch netbook but not combined it with the good points of the first machine? The NF310 has a matt HD screen (1,366 x 768) and a powered USB port, but no UMTS. Another difference is the colour options. The NF210 is only available in ivory white; the choice of titanium silver has been removed. Because of the almost identical hardware we will not repeat certain points or will only touch on them briefly. 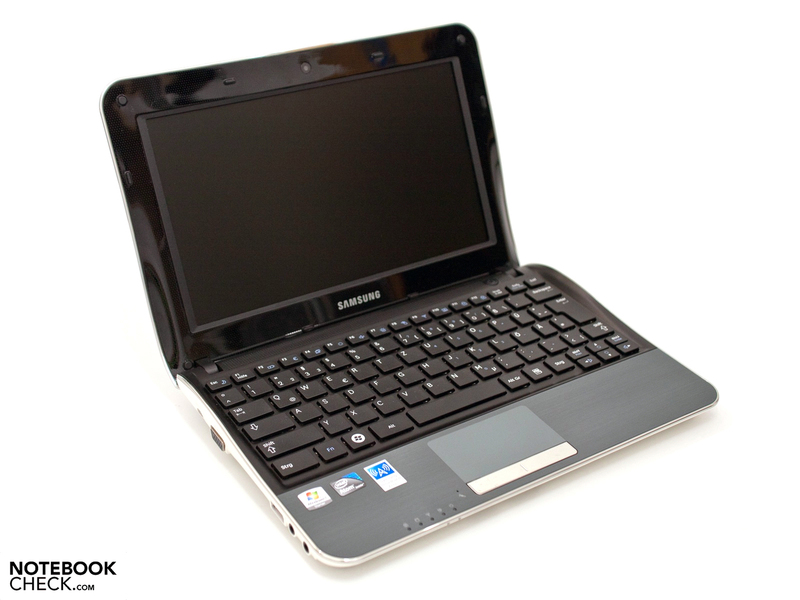 For comparison please see our review of the Samsung NF310-A01 Netbook. The Samsung NF210-HZ1 in this review is the top model which comes with UMTS and is sold for €429 (RRP) including tax. This puts it at the same level as the NF310 model, so you will have to choose between them whether you want to or not. The cheaper NF210-A01 without the mobile internet via UMTS costs only €369 (RRP). So is it a purchase that we can recommend, or just another product whose worth is entirely questionable? We take a closer look at the features of this great white shark. Samsung has not made any changes to the case of the NF310-A01, making a good job of the screen hinges and the workmanship overall. However, the flat front portion of the base unit is not as convincing in terms of robustness. A further criticism is that the recess for the six-cell battery (included) does not hold it tightly enough in place, allowing it to move noticeably. For €400 you would expect more precision. Another difference is the colour of the netbook. The NF310 is offered in titanium silver whereas both versions of the NF210 are only available in ivory white. 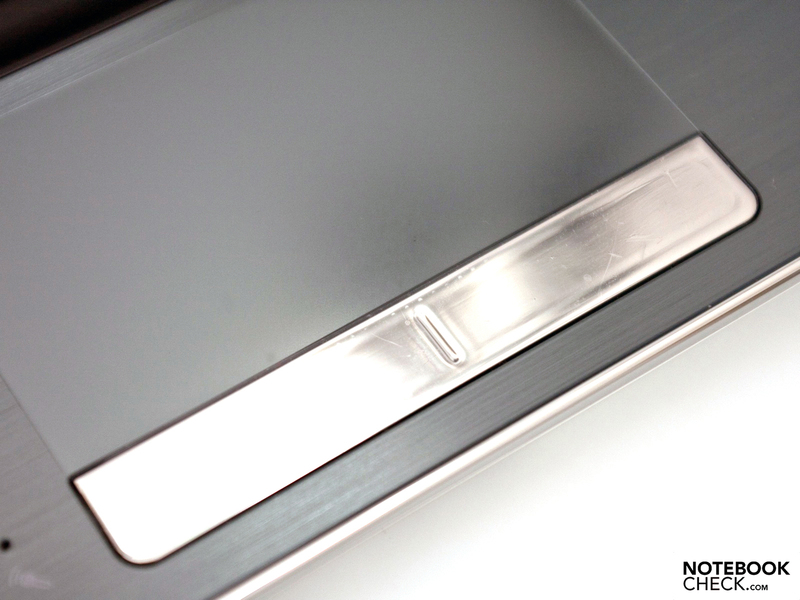 The finish is convincing and we did not find any badly fitting parts. The hardware can be upgraded with some effort, made harder by a number of screws and hooks. Once the bottom half of the base unit is removed, you have open access to the integrated 2.5-inch hard drive (9 mm height). The RAM can be accessed directly through an access panel on the underside of the machine, without dismantling the case. 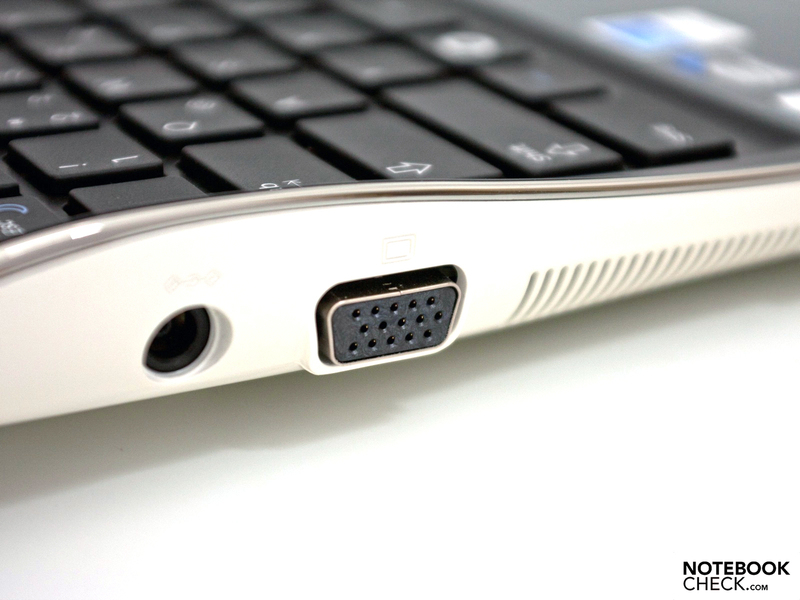 The ports have barely changed from the NF310 model, leaving the standard netbook range of connections. The only difference is that the powered USB (for charging peripherals) has not been kept. There are three USB 2.0 ports, a VGA port, audio ports (without S/PDIF support), an Ethernet port and the Kensington lock slot, as well as a 4-in-1 card reader which supports the new SDXC standard alongside the usual formats. 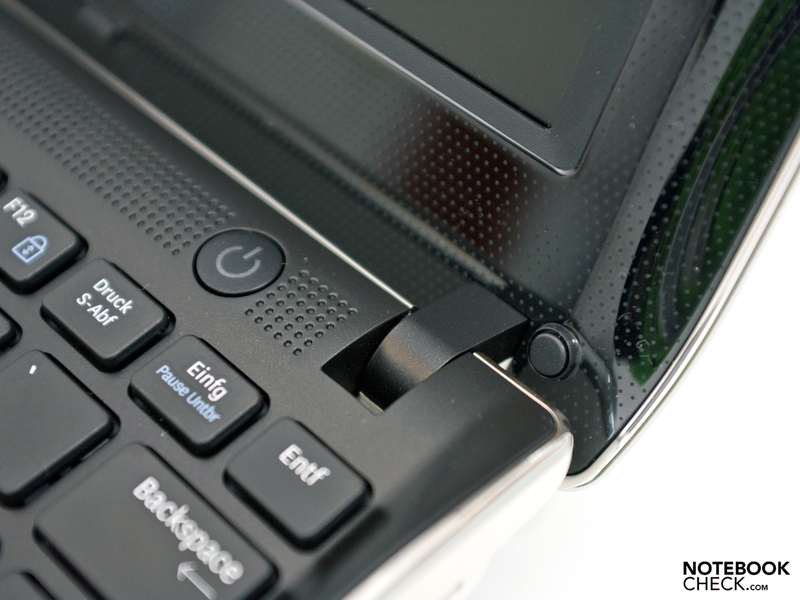 The netbook’s wired connectivity is not the most up-to-date; the integrated Marvell Yukon Controller (type 88E8040) does not support Gigabit speeds. 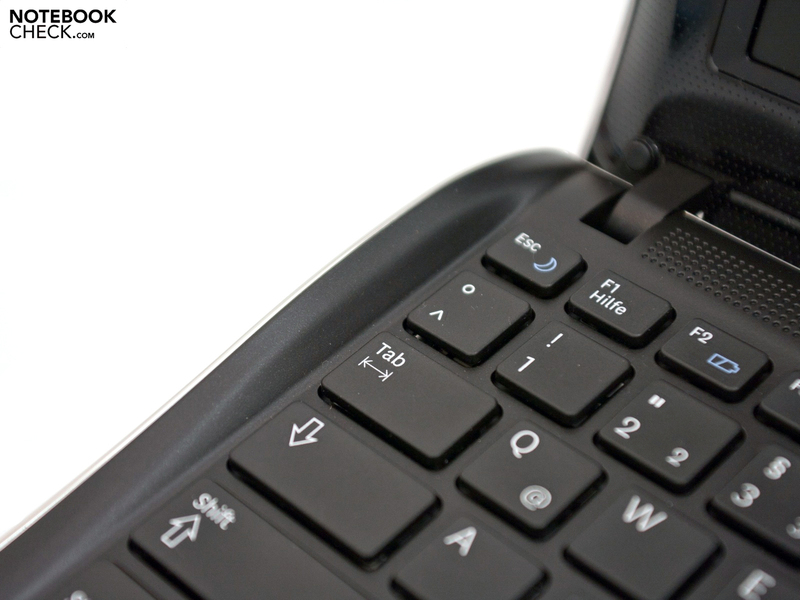 On the other hand, the netbook supports the modern WLAN standard of 802.11n (Draft N), along with Bluetooth 3.0 +HS. If you opt for the more expensive NF210-HZ1, you also get an integrated UMTS module (Samsung GT-Y3300) which enables mobile access to the internet. This is a feature which marks it out from the crowd and from its immediate rival (the NF310). The extras included in delivery are not extensive; you will find only the mains adaptor and power cable, the six-cell battery (48 Wh), and a few guides. 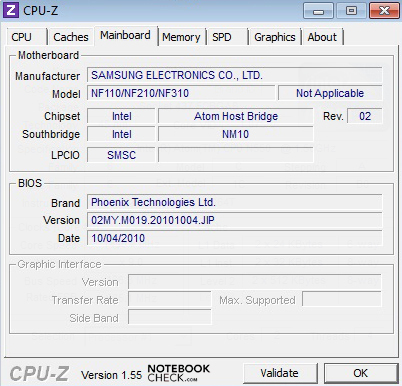 The software, aside from trial versions of Microsoft Office 2010 and Norton, only extends to the usual freeware programs and numerous additional Samsung programs. After you start up you can see 61 pre-installed programs listed altogether, including numerous pieces of bloatware which you should remove if they are unwanted. Samsung offers a 24-month warranty period including a collect and return service. You can also opt for an extended warranty which is one year longer. This costs around €50 extra. 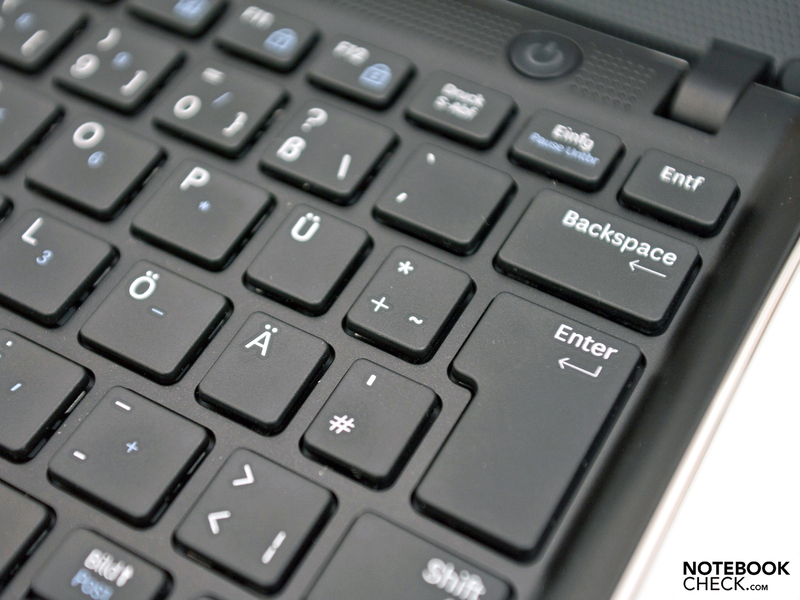 The touchpad and keyboard are no different from those on the NF310 netbook, and so we refer you to our review of that machine: Keyboard and touchpad (Samsung NF310-A01 Netbook). The entry-level price of the NF210 has led to sacrifices in the quality of the screen. The 10-inch display does have a matt surface, but the native resolution is the usual 1024 x 600 pixels. The NF310-A01, on the other hand, had a matt screen of the same size but with a resolution of 1366 x 768, which was a step in the right direction. One advantage of the screen used here is its two interpolated (higher) resolution settings that can activated if desired. This gives resolutions of 1024 x 768 or 1152 x 854. The whole of the screen is illuminated using LEDs, giving a maximum brightness of 251 cd/m². The average brightness of 235 cd/m² is also convincing and above-average, though it does not compare to the Asus R101 netbooks, whose screen offers an astonishing average brightness of 304 cd/m². The distribution of brightness is convincing at 87%, but the contrast and the representation of black are not ideal. The black level is greatly elevated at 2.03 cd/m², so that black looks more like grey and you cannot see the full intensity of an image. The contrast ratio which results from this is not particularly high at 119:1, which will hamper use of the netbook outdoors or when watching media. 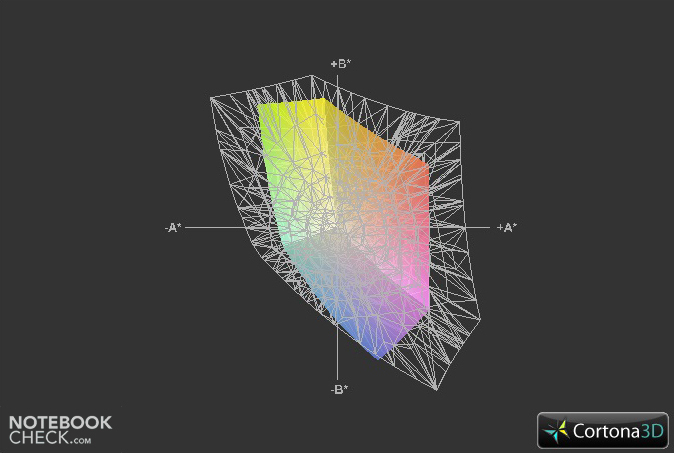 The colour space that a machine is able to represent is important for professional users especially. We could not make out the specific model number of the screen that was used here. Its colour space is substantially smaller than sRGB, at the level of an inexpensive notebook or netbook. 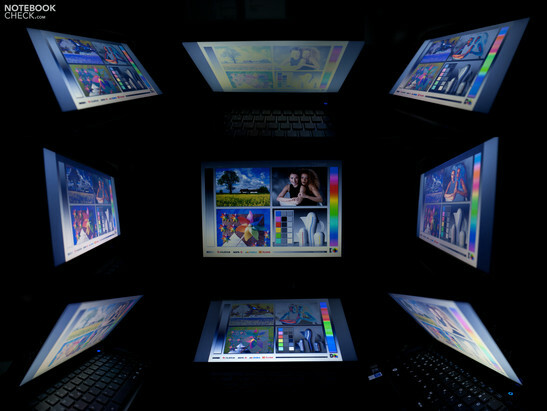 It is good enough for the everyday user, but graphics and design professionals would not be satisfied with it. Outdoor use of the netbook is certainly possible thanks to the good screen brightness, although the poor contrast means that colours will quickly appear washed out. Indoors or in the shade, the screen can be seen without any problems. The screen’s matt finish is particularly helpful in this regard. The viewing angles follow the usual pattern. Horizontally, the picture stays the same through some quite wide angles up to around 150 degrees, with no colour inversion. Vertically, all it takes is a small deviation from the ideal viewing position for the screen to be flooded with white or for the colours to invert, giving the image the appearance of a photographic negative. 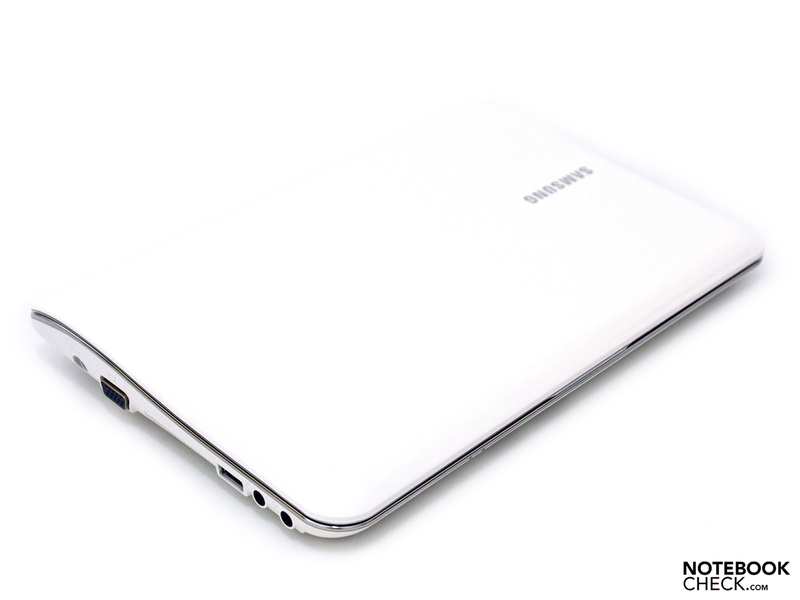 You should not release a new netbook with old hardware; Samsung has opted for the latest Intel Atom N550 dual-core processor with 2 x 1.5 GHz and 1 MB of L2 cache. As well as this improved office performance, the thermal design power (TDP) is good at only 8.5 W including the graphics unit. 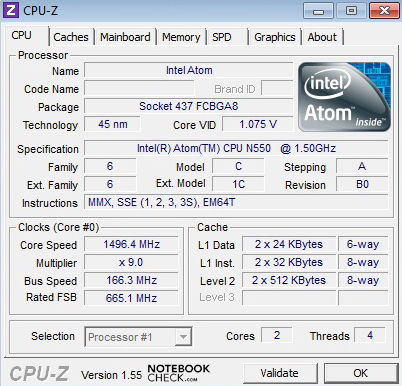 The older single-core Intel Atom models, the N450 and N455, have a TDP which is 3 Watts lower. 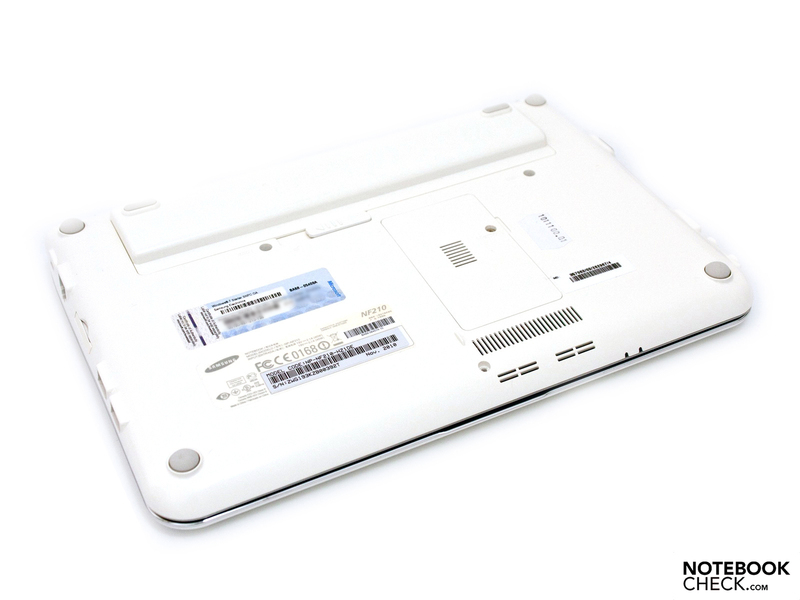 As with most netbooks, the graphics for the NF210 are handled by an Intel GMA 3150 integrated into the processor. 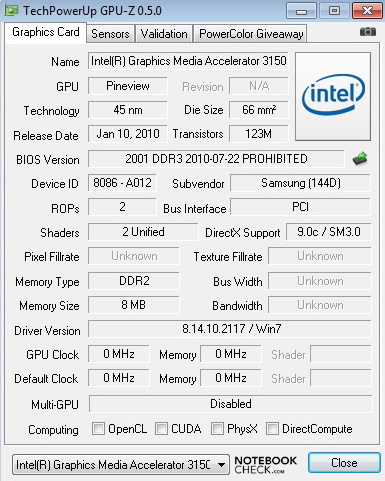 With a low core speed of 200 MHz (DirectX 9c), the GPU was not designed to cope with games; aspiring gamers should look instead at more powerful subnotebooks. An older driver (8.14.10.2117) is pre-installed on the netbook. It is recommended that you install the latest version, 8.14.10.2230, from the Intel Download Center. The download is free and the update is quickly installed. 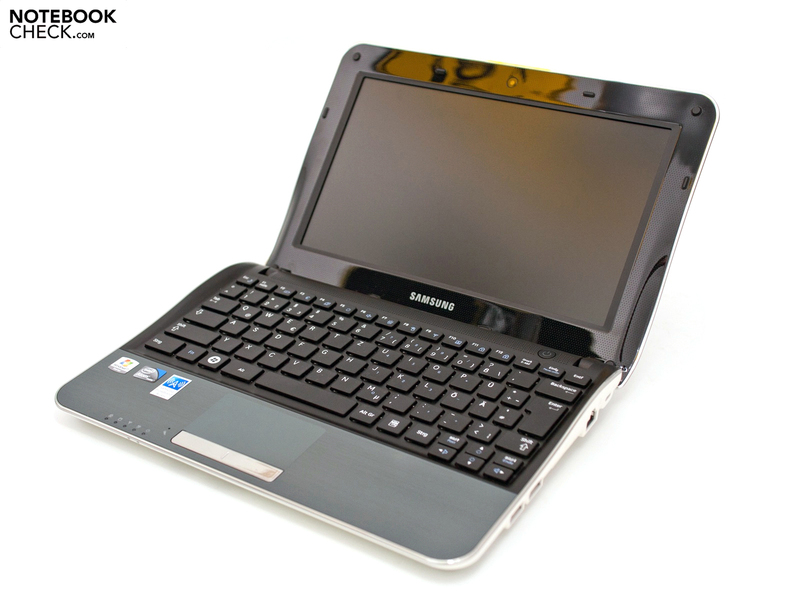 The netbook is also kitted out with a 2.5-inch hard drive (9 mm) with a total capacity of 250 GB, and 1 GB of DDR3 10600S RAM, which has a speed of only 667 MHz according to Samsung. 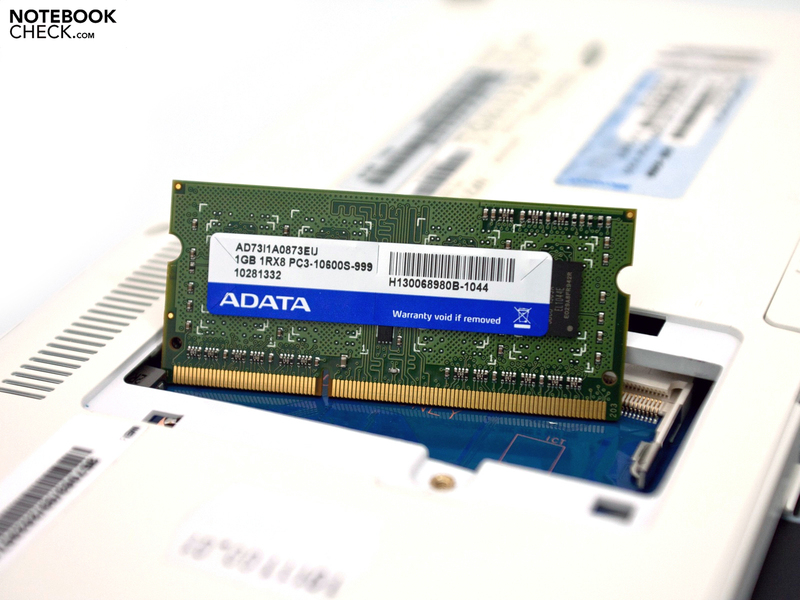 As there is only one slot for memory, a 2 GB module would be the maximum you could put in. 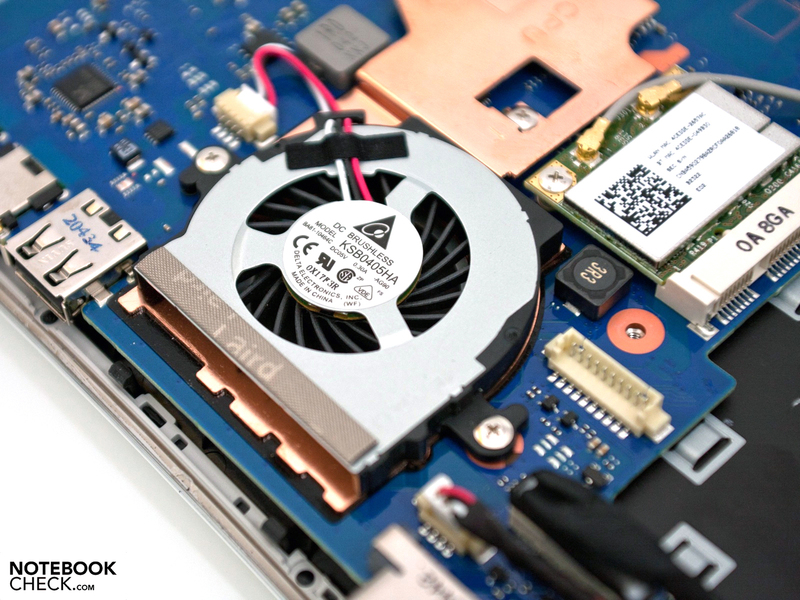 We tested the performance of each integrated component using various benchmarks. During this, the Microsoft Windows 7 high performance profile was activated and all energy-saving functions were turned off. This scenario does not produce any overclocking of the CPU. With its Intel Atom N550, the NF210’s strengths most certainly lie in its application performance. 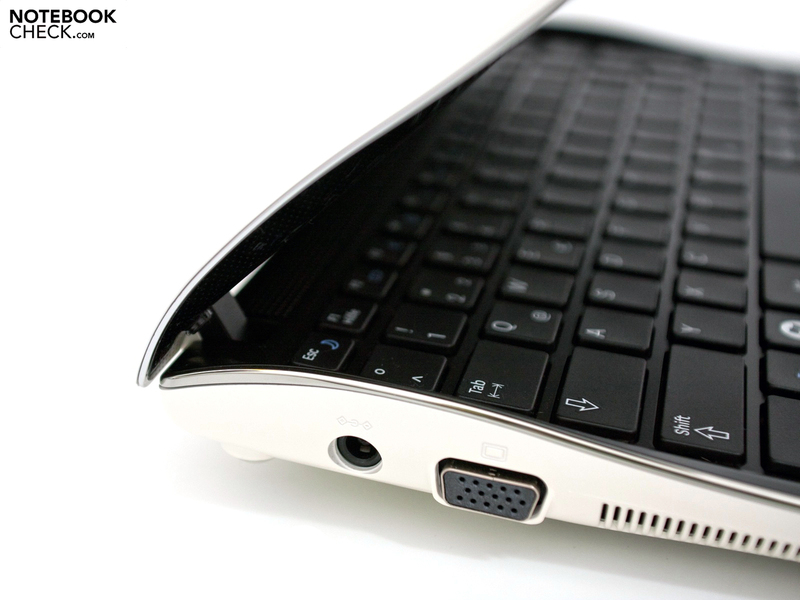 With 1,614 points in the PCMark 2005 test, the netbook lands within the expected range. The performance feels acceptable, though an upgrade to 2 GB of RAM would not be a bad idea to help out Windows 7. With 1 GB, it can take a while for new windows to load, and the system feels a little sluggish at times. The Futuremark gaming benchmarks show that the netbook’s integrated components will provide poor gaming performance. Scoring only 107 points in the 3DMark 06 benchmark, the NF210 is right at the bottom of the gaming league. 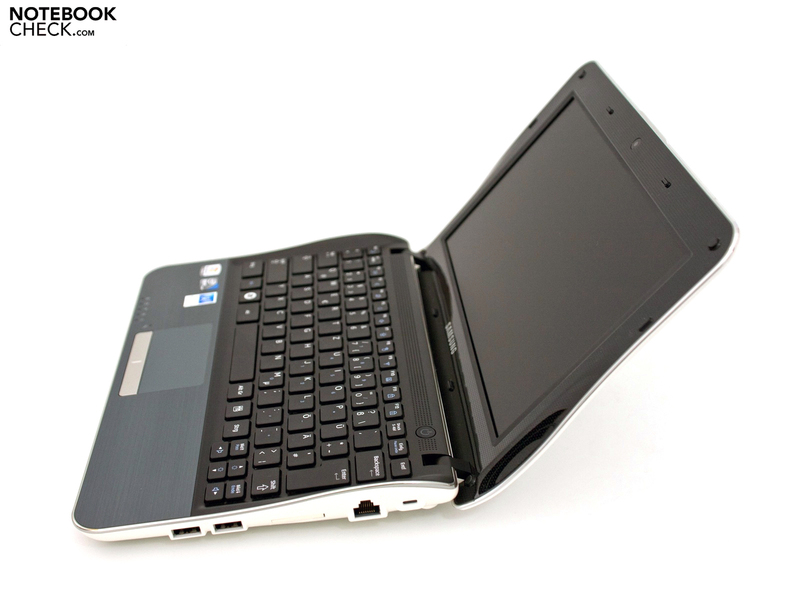 Comparable netbooks would be the Asus Eee PC 1018P with Intel Atom N455 or the Acer Aspire One 533 netbook. Machines with Nvidia ION 2 or Intel GMA HD graphics units offer an improvement in performance, but with a step-up in price. The latest PCMark Vantage test measures performance from all areas of the computer at once. 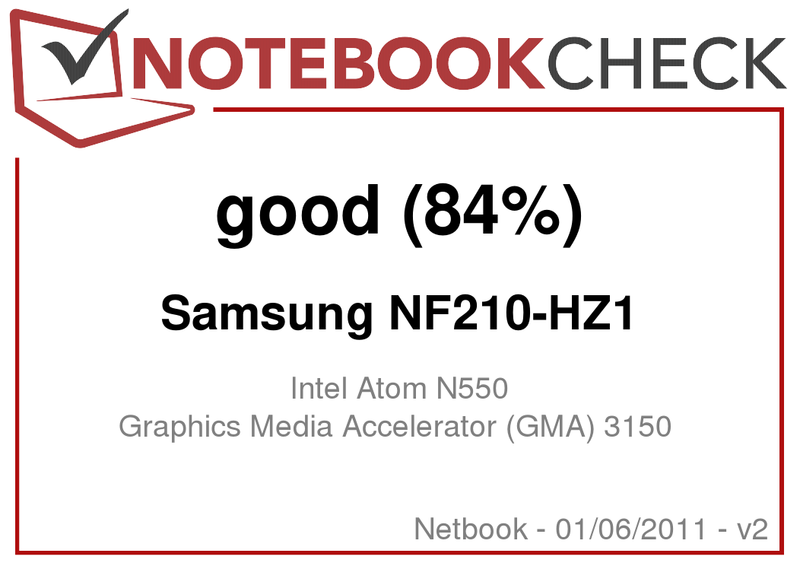 In this benchmark the NF210 scores 1,640 points, placing it somewhere in the middle compared to other current netbooks. 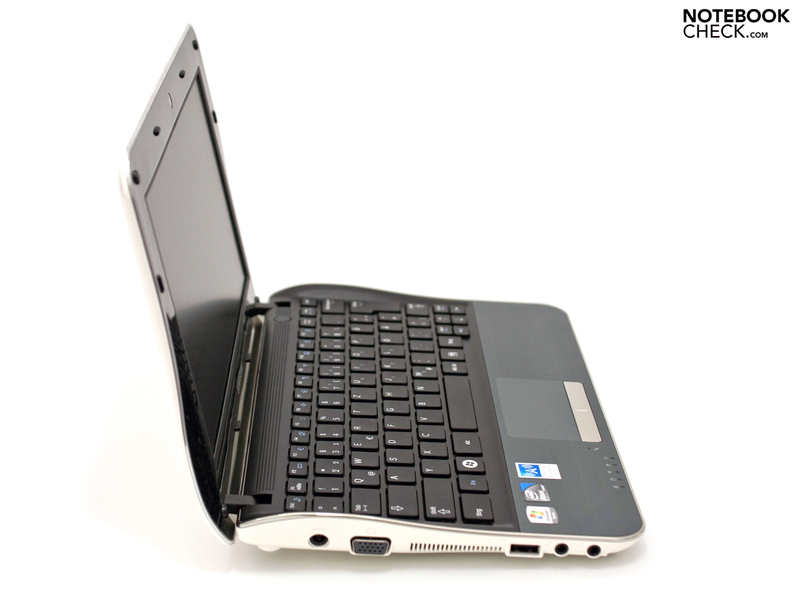 For example, the HP Mini 5103 business netbook and the Asus Eee PC 1015PEM achieve similar scores, whereas the netbooks have no chance against such contenders as the Dell Inspiron M101z subnotebook with AMD Radeon HD 4225, which scored 2,490 points. The integrated Hitachi Travelstar Z5K320 hard drive (model number HTS543225A7A) works at 5,400 rpm with a capacity of 250 GB. The average transfer rate (sequential read) is not especially high, but acceptable, at 58.7 MB/s. Similar standard hard drives can achieve an average of 65 MB/s. 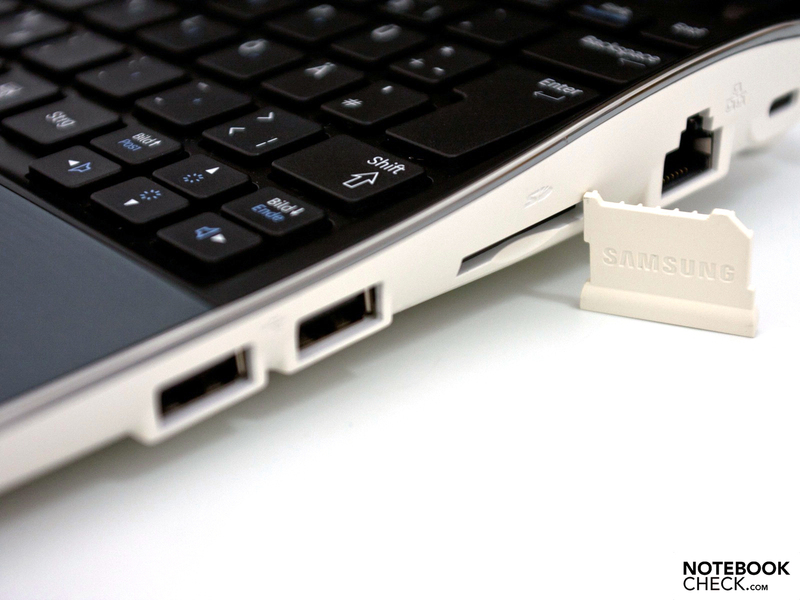 Exchanging it for a faster hard drive or Solid State Drive (SSD) is most certainly possible. 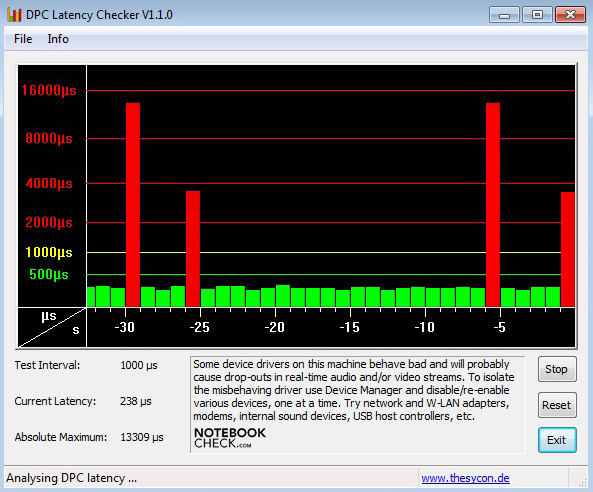 The DPC Latency Checker tool gives you a visual report of the latencies under Windows 7; the netbook showed some unwelcome spikes into the red zone above 2000 µs. Deactivating the wireless module does not have any effect. One problem that can be caused by higher latencies is crackles of sound when using external sound cards. 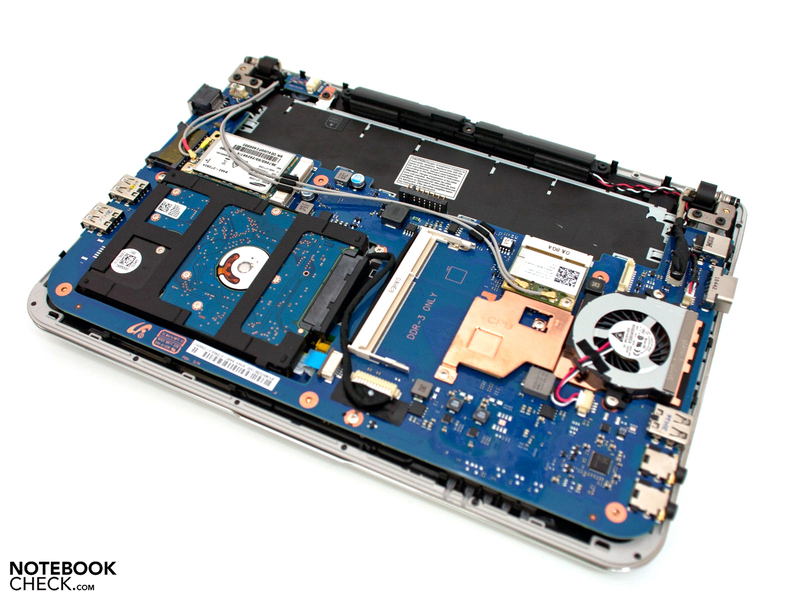 The noise produced by the netbook is not excessive, and is acceptable for the most part. In idle we measured a maximum volume of 31.2 dB(A), which is very innocuous. One criticism would be that the fan runs almost constantly, only taking a small break during times of minimal processor activity. 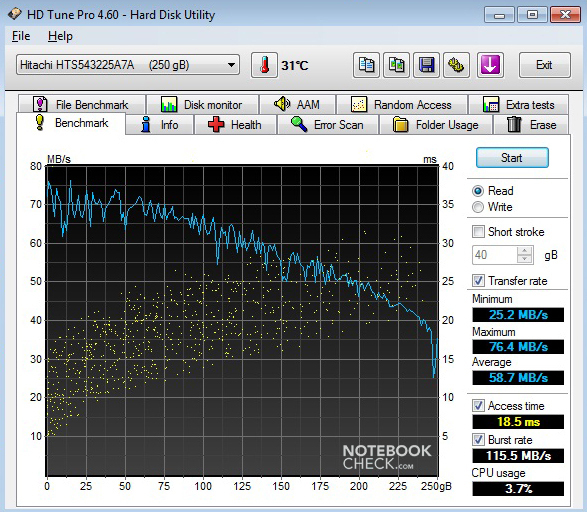 The hard drive noise stays in the background at 32.6 dB(A). Under heavy stress, the system noise rises to a maximum of 33.7 dB(A), with the fan reverting to a slower speed impressively quickly once its work is complete. The surface temperatures in idle are good; the maximum temperature of 29.2 degrees Celsius remains in the green zone. The palm rest and other ergonomically important places stay cool, so it does not become difficult to work with. Under heavy use the temperatures get a little higher, and a small build-up of air produced our maximum reading of 35.7 degrees Celsius in the area of the vent. On the underside of the machine you can feel a slight increase in temperature, but it gets no worse than that. (+) The average temperature for the upper side under maximal load is 26.8 °C / 80 F, compared to the average of 29.8 °C / 86 F for the devices in the class Netbook. (+) The maximum temperature on the upper side is 31.6 °C / 89 F, compared to the average of 33 °C / 91 F, ranging from 21.6 to 53.2 °C for the class Netbook. (±) The average temperature of the palmrest area of similar devices was 29.3 °C / 84.7 F (+0.7 °C / 1.2 F). The white shark’s speakers are practically indistinguishable from the hordes of other poor-quality netbook speakers. The sound quality is uneven; high tones are clearly represented, but the maximum volume is not comfortable to hear. The lower tones and bass notes are absent, which makes it unpleasant listening to music with the built-in speakers. There is a 3.5 mm stereo port for attaching a headset or external speakers; the sound quality using this option seems acceptable, with no sound disturbances. The Intel Atom N550 processor with its integrated graphics unit has definite advantages when it comes to battery life and energy consumption. Despite a speed of 2 x 1.5 GHz the nominal thermal design power (TDP) is only 8.5 W. And this value is reflected in our energy readings. 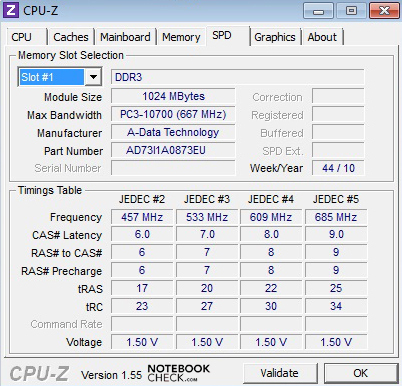 In idle between 6.6 W and 10.9 W was needed; with heavy use, the consumption increases but is still within reasonable bounds, with a maximum of 18.2 W. The energy usage when the netbook is turned off or in standby is unexceptional at 0.1 W and 0.3 W respectively. Thanks to the low energy consumption and large six-cell battery with 48 Wh (6,600 mAh) the NF210 is well placed to achieve good battery runtimes. 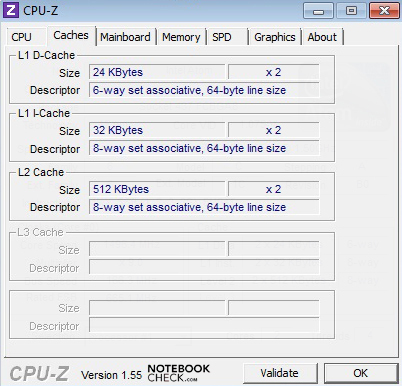 The 'Classic' Battery Eater test uses an Open GL calculation to simulate a high-stress situation for the netbook and so determine the minimum battery life. 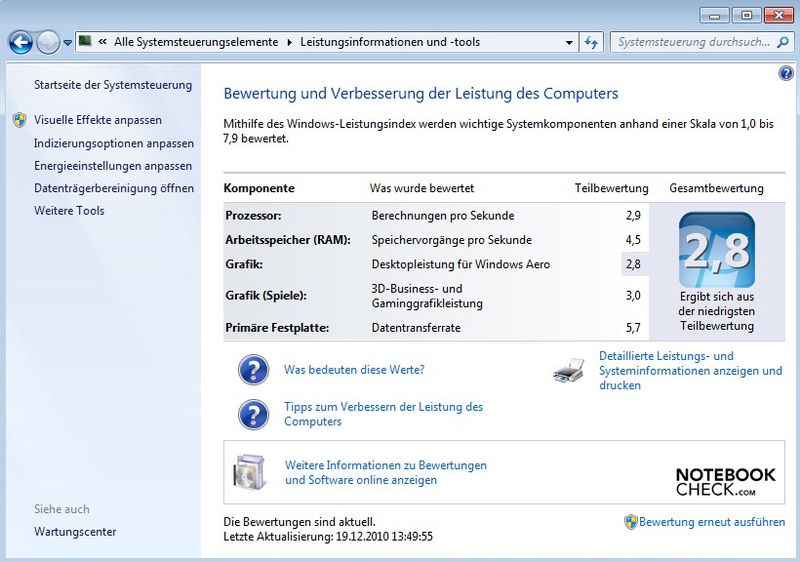 In addition, the screen brightness is on maximum and the Windows 7 high performance profile is selected. After 4 hours and 6 minutes (246 minutes) the battery’s power is drained and you have to return to a wall socket. 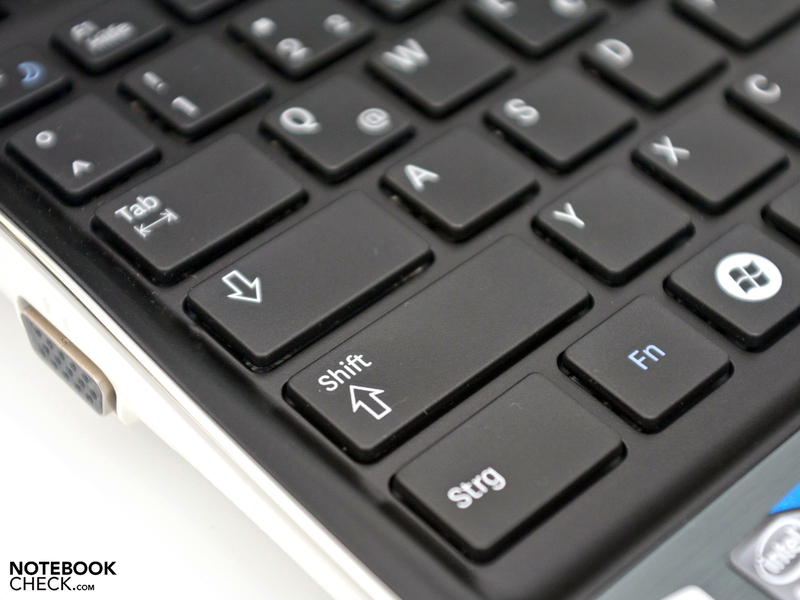 But most people use a netbook for surfing the internet or writing emails with a comfortable screen brightness setting; in this situation, the battery lasts for 7 hours and 15 minutes. Maximum battery life is determined by the ‘Reader’s test’, which simulates reading a text document with minimum screen brightness and the wireless deactivated. The Windows 7 energy-saving options are also activated. 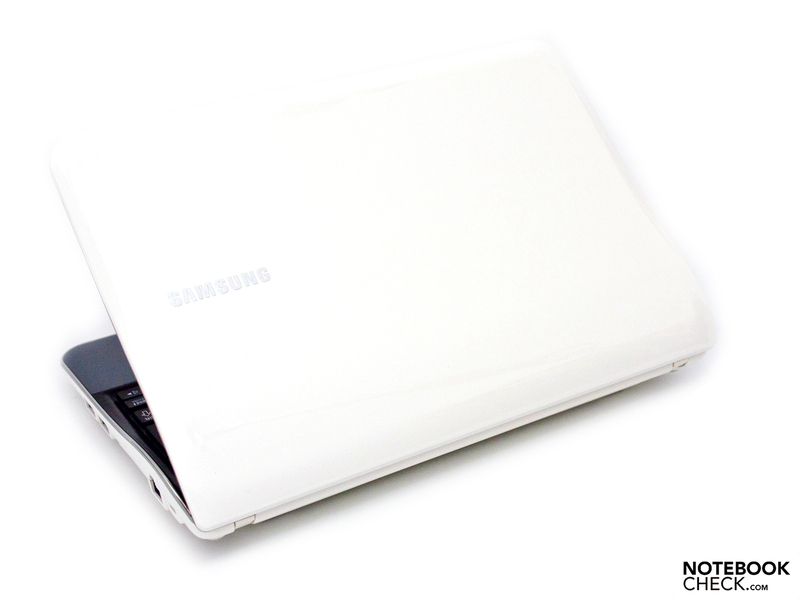 The Samsung netbook achieved a maximum runtime of 10 hours and 21 minutes, a good performance which is on a par with other netbooks with similar hardware configurations, but also with other single-core netbooks. 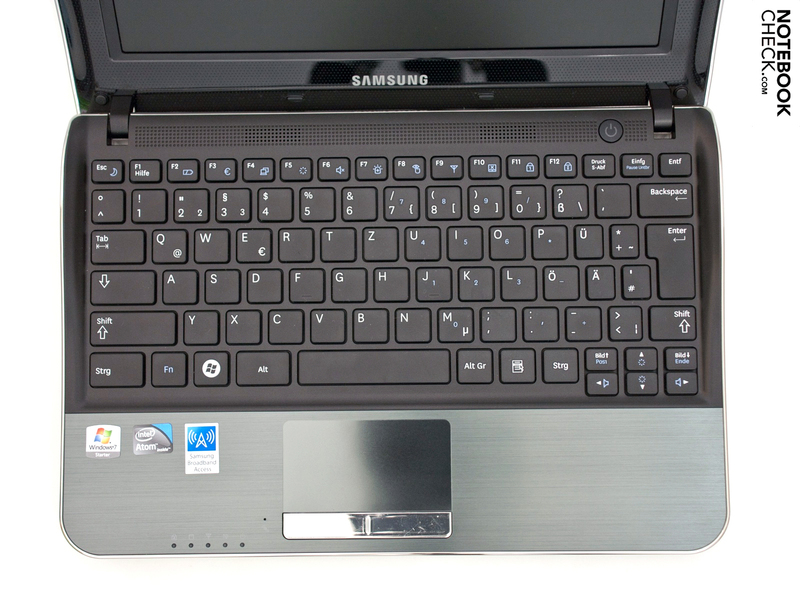 The Samsung NF210 is the more mobile counterpart of the NF310, but with a worse screen. The case is impressive with its undulating shark design, and an ivory colour that makes it into a great white. The selection of ports is ordinary, but the integrated UMTS module is a definite advantage for mobile communication. The Intel Atom N550 provides acceptable performance for applications. The netbook is not at all suitable for gaming. A glut of pre-installed programs (bloatware) slows the netbook down further. The 10.1-inch screen (1024 x 600 resolution) is suitable for use outdoors thanks to its good brightness, but its poor contrast and dull representation of black count against it. The Samsung NF210 may not be a fully fledged multimedia machine, but its bold design, good workmanship and UMTS module are significant points in its favour. The entry-level price of €429 (RRP) is entirely justified. If you can do without the mobile internet, take a look at the Samsung NF310-A01 instead with its HD screen, or the less expensive NF210-A01. We reviewed the Samsung NF210-HZ1 in ivory white. … with just a few keys that are too small. The touchpad supports a range of multi-touch gestures. Despite their small size, the hinges hold the lid firmly in place. 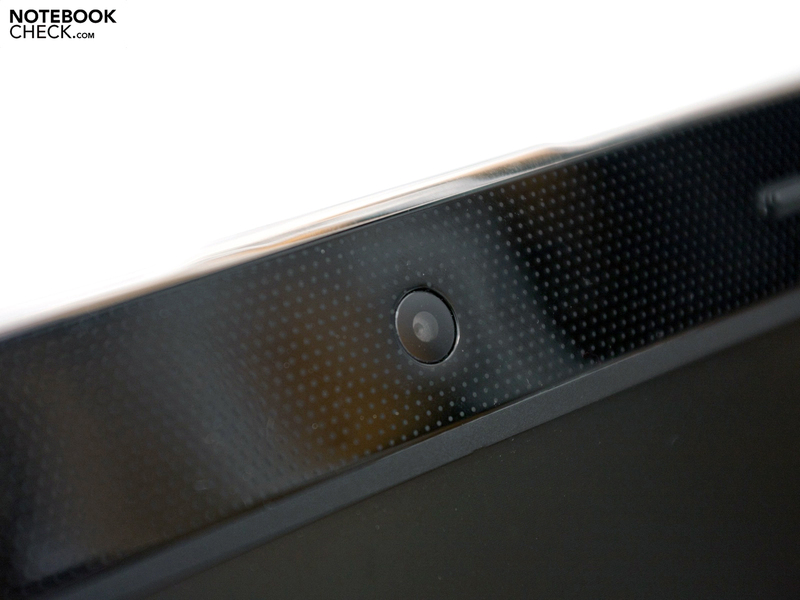 A 0.3 megapixel camera is good enough for conversations over Skype. 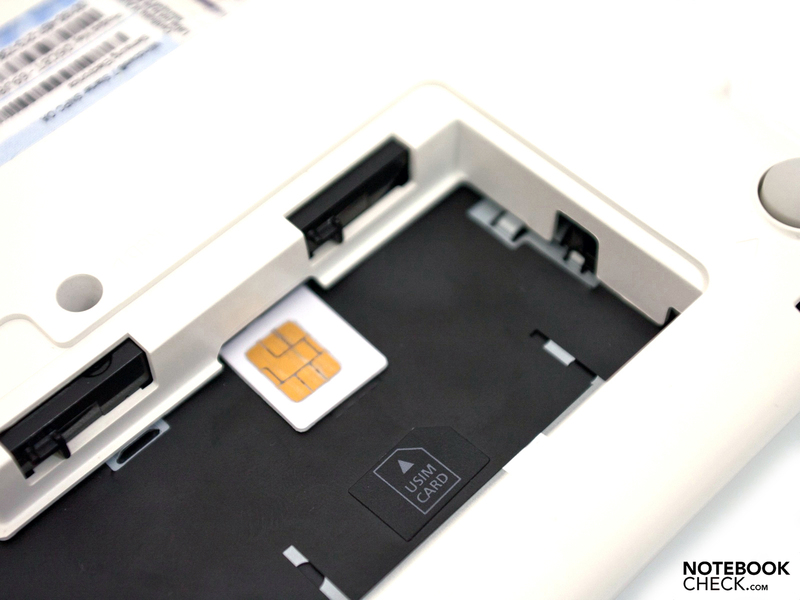 You can use mobile internet thanks to the integrated UMTS module. 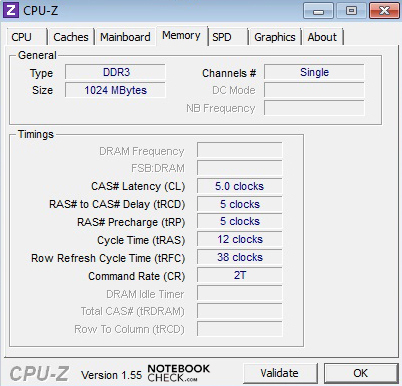 The memory (DDR3 10600S) is easily exchanged. The small fan does an excellent (and above all quiet) job. 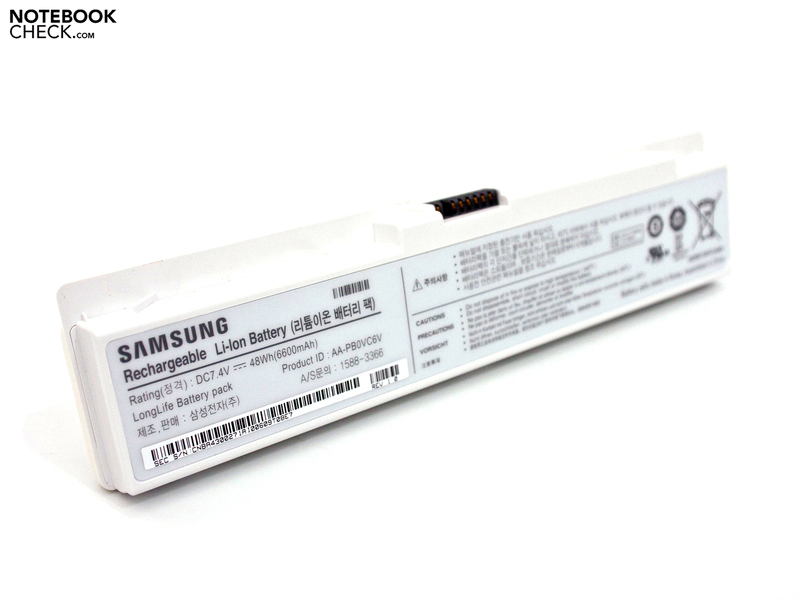 The six-cell battery (48 Wh) can last for up to ten hours. Various status LEDs and the microphone next to the touchpad. SDXC is supported along with the usual card formats. The case is identical to the NF310-A01. There is only one choice of colour. Only the NF310 is available in ‘titanium silver’. The bottom of the base unit has one access panel. The shark design makes an excellent impression. The lid is also slightly curved. The VGA output port offers good picture quality. 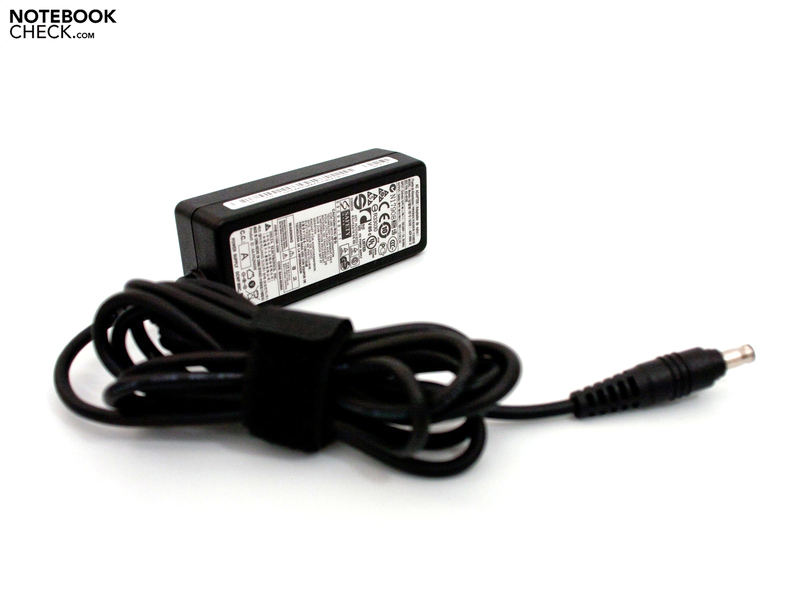 The black mains adaptor weighs only 180 g.
The integrated UMTS module and the shark design of the ivory white NF210. The matt HD screen of the NF310-A01, a larger selection of ports and a better choice of pre-installed software. 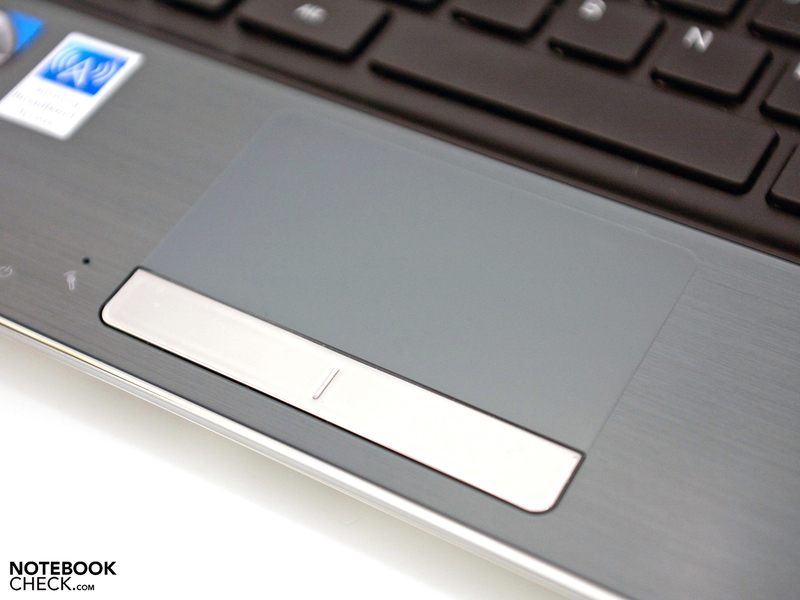 The good battery life, on a level with the single-core netbooks, and the upgradability of the components. 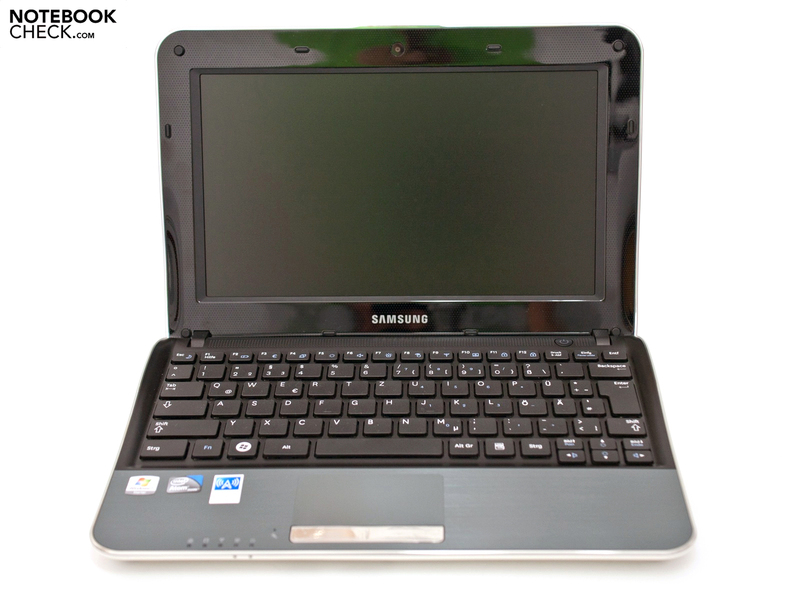 The Samsung NF310-A01 is a direct competitor with its better screen, or the Asus Eee PC 1015PEM in its tried and tested case, or the Asus Eee PC 1015PN with Intel Atom N550 and Nvidia ION 2 graphics unit.